The customary greeting is done by putting your palms together and with a slight nod of the head, saying "namaste." More films are made in India ('Bollywood') than in the USA ('Hollywood')! India lies in south Asia, between Pakistan, China and Nepal. To the north it is bordered by the world's highest mountain chain. The capital of India is New Delhi, and the country’s largest cities are Mumbai (formerly Bombay), Delhi, and Kolkata (formerly Calcutta). India still uses the postal system and it shows. They still have the largest postal system in the world. There are over a million Indian millionaires. However, the gap between the rich and poor is still very big, with many living on a poverty level. With over 1.2 billion people, India is second only to China and will likely overtake China if current growth continues. The first university is said to have been started in Takshila in 700 B.C. Thousands of students from all over the world studied a variety of subjects. In order to accommodate the huge population, India does have the seventh largest land area in the world. The main food staples in India are rice in the south, wheat in the north, and dhal or lentils. India has no National Language. Hindi is an official language used in many regions, English is also commonly used in many regions. There are many popular regional languages like Tamil, Malayalam, Telugu, Kannada and Marathi spoken and officially used in their respective regions. On August 15, 1947, India gained independence from the British, after a successful nearly non-violent independence movement. Chai, or tea is drunk widely in India. They produce more tea than any other country, exporting to countries all over the world. This temple in Tirupathi is the most visited pilgrimage destination in the world, even more than Mecca or the Vatican. India's population is one billion making it the second most populous country after China. 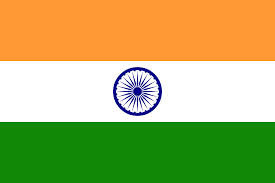 India is the largest democracy (Government by the people, like the UK is) in the world. Baudhayana, an Indian mathematician first calculated the value of PI. He is also said to have discovered other mathematical theorems still in use. India is mainly an agricultural country, though it also has a large iron and steel industry and produces every type of manufactured goods. It’s estimated that in the next two to three years, 25% of people entering the workforce will be Indian. Having been visited by Buddha in 500 B.C. Varanasi is the oldest continuously habituated city in the world. India has the world’s second largest train network, and it is the largest civilian employer.